Antiques Roadshow – À la façon du Ruggist. Please imagine if you will the rest of this article being conducted with the rug hanging on the wall, me with a pointer waving it over the rug pointing out things as I discuss, looking fashionable and “expertly” much like the far more knowledgable James Ffrench. My commentary will now commence; so Amanda (and everyone else reading) this is what you have found and now own. As you already know this is a Lapchi Carpet, or rug if you will. Common usage would have this be called a rug like Amanda has said, but for those of us in the field we would call this a carpet. Now why is that you may ask? Well historically that is what it would have been called, and it is also about size and use, but also in contemporary usage, about marketing. Carpet just sounds nicer even if it is a bit affected and snobby in everyday parlance. So we call it a carpet to be true to our historical roots and to remind those people who make that abomination they call “carpet” that it is actually broadloom that they should know their place in the world of floorcovering. 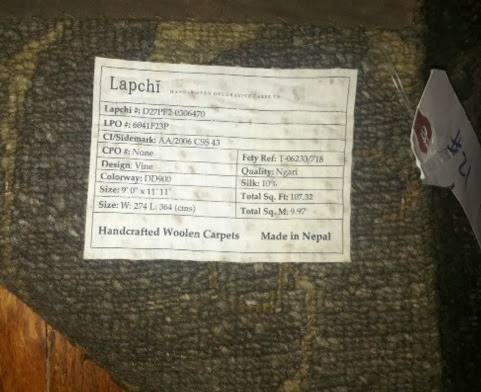 Lapchi, as you may know from your research, is a maker of Tibetan construction carpets out of Nepal. They are very well known in the rug and carpet industry for their colour, designs, and what was at the time they introduced it, revolutionary approach to carpet making: Telling the customer they could have exactly what they wanted and then of course actually providing it in an EASY manner. At the time, which would have been around say 2004 or so, this was very novel, and dare I say was almost an underdog move, but offering an endless number of options (size, colour, shape, texture…) was not always top of mind for many makers, especially the other large makers of Tibetan weave at the time. The other great thing about Lapchi is that they are fanatical about managing their business in a modern way, which you may also be shocked to hear, also doesn’t always happen with rug and carpet makers. The result of this approach is most readily apparent in the label on the back of your carpet. From this label we can tell many things. First there is the obvious information: It’s a Lapchi carpet. 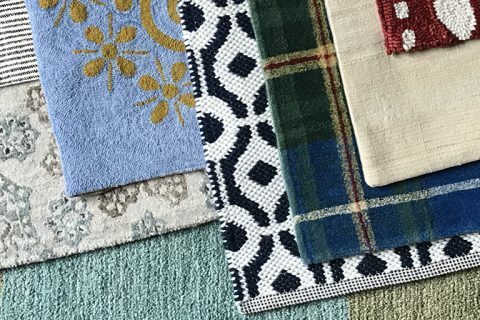 It is 9’0″ x 11’11”, the total area – that is important to note because on the wholesale level most rugs and carpets are bought and sold by the square foot, and the material content, in this case 90%wool and 10%silk. Now that is only for the knotted pile. 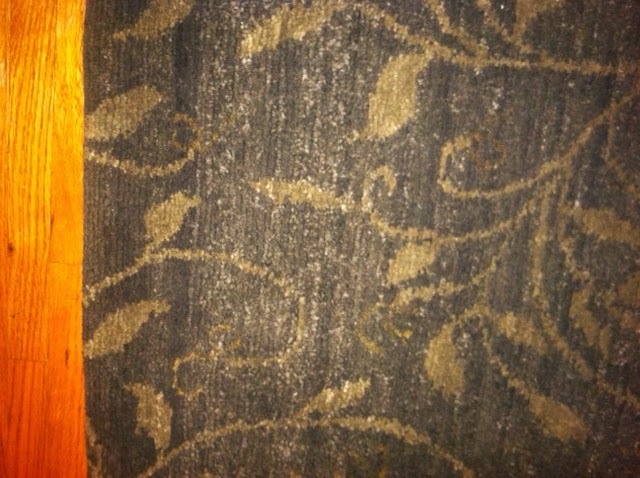 The foundation of this carpet, the “base” of the carpet is cotton. Traditionally the foundation (consisting of warp and weft strands) would continue past the ends of the rug and be finished as the fringe. 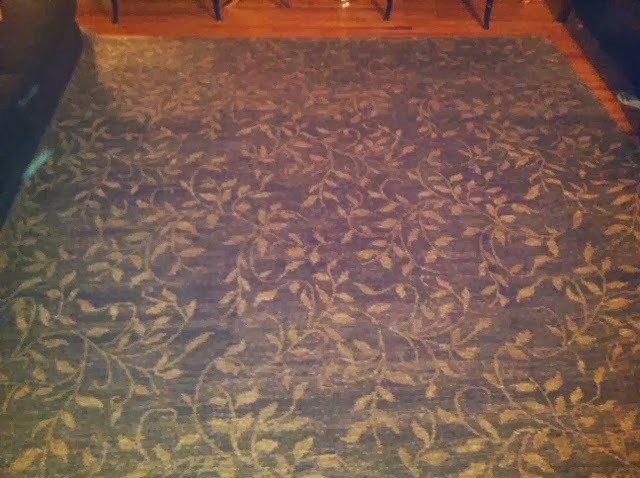 With this carpet the fringe component is still there, though it is has been bound to the back and covered with fabric. 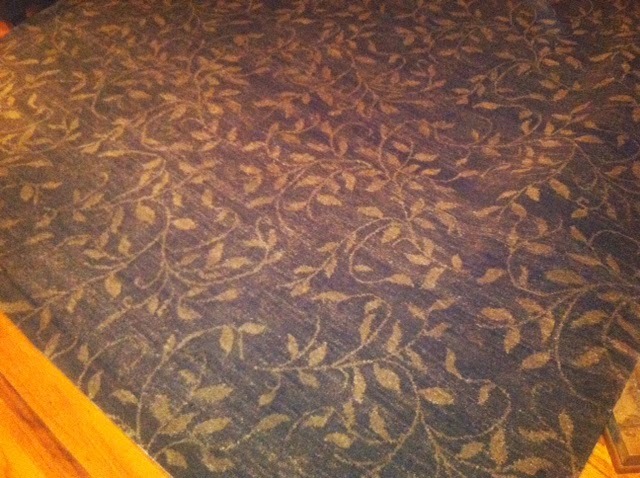 This was done to give the rug a more modern look. We can also see the design name of “Vine” and that it is in colour “DD900” which is an internal code for this colourway. There is also a quality shown: Ngarri. The design “Vine” was inspired from a textile work drawn from the Wiener Workstatte, which was a group of associated visionary Viennese artists (amongst them Joseph Hoffman) that was active in fin de siècle Europe through the onset of the Great Depression and World War II. Akin to the Arts and Crafts movement, you will find a flat, naïve, and clean look that is borrowed from the Japanese. Lapchi has used many textiles from this group in its early (mid 2000s) design work. As for the “Ngarri” quality, which is pronounced “nar (like in narwhale) e (like the letter). This is a construction method which employs either tightly spun, or as some like myself call it, overspun wool yarn knotted to the aforementioned foundation. It produces the very nubby texture you can see and feel, and makes for a long wearing pile. Now for what the label tells us in a more coded way. 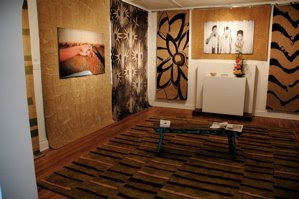 The rug was ordered by a Lapchi dealer as a showroom sample, that is to say a rug to have in the showroom to both sell and to sell from, in the late winter of 2006, most likely at the North American Rug Show (NORS) in Atlanta. That dealer’s name? Aubrey Angelo in Minneapolis. And since Amanda found this rug in a thrift store in suburban Minneapolis we can safely assume that the rug did indeed end up with that dealer before being sold locally. How it made its way from that customer to the thrift store however is beyond what we can know, but if I were to guess I would say that the owner either redecorated and replaced the rug, or given the economic climate of the past few years, may have lost their home to foreclosure. In either case, there is really no way of knowing without a more thorough investigation. On the face of the rug you can see some fantastic abrash, which is a rug and carpet specific term for colour variation due to dyeing. It’s very apparent in the corner, and for the most part, aficionados, collectors and experts such as myself have a high degree of appreciation for this. It’s not considered a defect. You’ll also note that at the beginning I said Lapchi makes “Tibetan construction” and that their competitors (when they started) made “Tibetan weave”. I made this distinction because there are colleagues of mine who would take exception to calling the rugs Lapchi makes “woven”. There is an ongoing, but died down, discussion about the concept of crossed vs uncrossed weaving and the merits of both. If you’re interested in knowing more, I would suggest reading the following (which is but one of my articles on the subject), but I won’t go into that any more here. Click here to read! Finally, it should be noted that this rug is certified to be free of child labour by the GoodWeave Foundation of which Lapchi has been a member since they started making carpets. The carpet would have had a label attesting to this fact, but at the time the carpet was made, GoodWeave was utilizing labels with inferior adhesive and it would have most likely fallen off soon after delivery to the original purchaser, if not before hand. With some research, this could also be verified, which would of course add to the provenance of this carpet. I am also inclined to do just that little bit more research to find out the specifics of how it came to be donated so that we could have a complete provenance of the piece, but perhaps that is best unknown. But what isn’t unknown is: How much did Amanda pay for the carpet? She paid $40.00 (USD) for this 9×12 carpet. Now I consulted my archived Lapchi price list from the era (to confirm) and found this would have retailed for say $80.00 (USD) – $90.00 (USD) per square foot back in the day, so about $9720.00 (USD) on the higher end of that estimate. It would likely cost the same or more to make new today so staying toward the higher end of that estimate would be the value I would use for insurance purposes. It is an interesting story, and one that opens a pandoras box of questions for our industry. I appreciate your time. Thank you, and goodbye. A discussion regarding how a carpet feels both to the touch and when grabbed; the hand and the handle.